This is the second installment of a series. Part one is here. 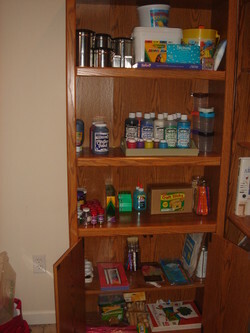 A well-stocked arts and crafts shelf is such a blessing in a home education household. There is no limit to a child's creativity and moms who step back a bit and relax in their roles as educators will find that there is no limit to their own creativity either. When inspiration hits, it's nice to have supplies on hand. And often, the right tools will be inspiring in and of themselves. Fingerpaints are fun and they offer so much sensory satisfaction. Do buy washable fingerpaint and it is well worth it to buy fingerpaint paper. Fingerpaint paper is glossy and allows the sliding that is crucial to the fingerpaint experience. Alternatives to traditional fingerpaint include pudding! Stir up vanilla pudding, add various foodcoloring if you like and allow your child the ultimate sensory experience--touch, smell, sight and TASTE! Play Mozart as you paint if you really want to cover all five senses. These paintings are not "keepers"--it's about the process, not the product. Place the cornstarch in a large bowl and stir in the water. Place the grated soap in a separate, heat-resistant bowl; add the boiling water and stir until the soap has melted; then pour the mixture into the cornstartch mixture. Stir to blend. Let the mixture rest until it has become a thick, fingerpaint texture. Divide in to separate bowls and add the juice dyes. This will last about a week in the fridge stored in glass jars with screw tops. For tempera paint, my first word of advice is to staunchly resist any urge to buy powdered tempera and mix your own. As Tomie de Paola remembers in The Art Lesson, once powdered tempera dries on the paper, it's very likely to just be blown away. Better to buy premixed washable tempera. You can thin it if necessary for projects that take a thinner medium. There are some ideas for using powdered tempera mixed with other media in Preschool Art: Painting; so if you've got some, don't toss it! There are lots and lots of other great painting and printing ideas there, too. Watercolors come in two varieties in our house. Once upon a time, I spent just enough time teaching in a Waldorf school in Charlottesville to fall in love with wet on wet Waldorf watercolor painting. Waldorf paints, while truly amazing, can be prohibitively expensive. I have found watercolors in tubes at AC Moore to be a suitable substitute. Watercolor paper stands up well to the wet on wet watercoloring of a young child. Essentially, the paper is wet before painting. Then, using liquid watercolors (not pan watercolors) the child is encouraged to play with the colors (as opposed to trying to paint realistic forms) by blending one fluid color into the next. For our nature backpacks, however, we use pan watercolors to be brought to life by creek water as often as possible! In addition to wet on wet painting, you can encourage play with color over focusing on form by providing flat, broad block crayons and modeling filling a blank paper with wide strokes of colors. And for everyday coloring, we use good old Crayola crayons. There's plenty of inspiration at that site too! Another lovely Waldorf art supply is modeling beeswax. This is sweet smelling and very hard at first, compared to typical play doughs. I give it to my children to warm in their hands while I read aloud. Because it holds its form so well, it can be molded into very delicate shapes. It's really never permanent though. Don't set a detailed figure on a windowsill--it's sure to melt. Preschoolers should have some good old soft modeling dough too. Lakeshore makes one that is scented (warning to moms in the throes of morning sickness: it's very sticky-sweet scented). Give a child modeling dough and he's going to ask for rolling pins and cookie cutters and the garlic press for making hair! And when you are weary of commercial prepared dough, crack open Mudworks and feast on the plethora of great recipes for making sand dough, edible dough, permanent dough, salt dough, and more and more and more dough! For older siblings, Model Magic and Sculpey are favorite modeling compounds. Once a year or so, I buy everyone a package of colored markers (usually for Christmas stockings or Easter baskets). Our preference really leans toward colored pencils. And for colored pencils, Timberdoodle and Prismacolors have been mainstays since the very beginning of our home education adventure. Next, we'll have a peek at language arts for little ones.